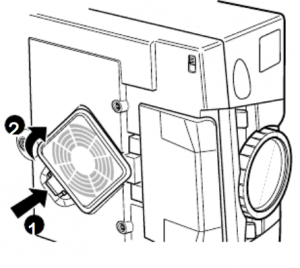 Clean the air filter at the bottom of the Epson EMP-7500 projector after every 100 hours of use. If it is not cleaned periodically, it can become clogged with dust, preventing proper ventilation. This can cause overheating and damage the Epson EMP-7500 projector. Keeping the air filter clean will prolong the life of your projector. Replace the Epson EMP-7500 filter cover.